SC Freiburg goalkeeper Noah Atubolu has received a call-up to Germany's U17 National team for international matches this month. The 16-year-old has been named in the squad for the four-team Under-17 International Tournament involving Ireland, England, Czech Republic and Germany. 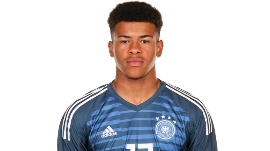 Atubolu debuted for Germany U17s in a 2-2 draw with Netherlands in August 2018 before featuring against Israel and Italy. He was not in the squad for the international friendlies against Denmark last month. Atubolu is one of two Nigerian goalkeepers expected to feature in the Under-17 International Tournament as Manchester City bound starlet Gavin Bazunu has been included in Ireland's squad list. This season, Atubolu has started nine games for SC Freiburg in the A-Junioren Bundesliga Süd/Südwest, posting one shutout and conceding 12 goals.